The national budget is the tool that a Government uses in order to structure its income and expenditure policies and also to give direction to the economy of the country. In a democratic country, each year the Government presents its budget in Parliament, in order to provide transparency and to obtain the people’s mandate for spending the people’s money. Governments collect taxes to fund public services. Taxes are the principal source of recurring revenue under government control. In all countries tax policy is at the heart of the political debate on the level of public services that should be provided and who should pay for them. Every year in Sri Lanka too, the business community eagerly awaits the reading of the budget in Parliament, to understand the macro economic factors as well as micro economic factors in the market. Taxation is a key element in the budget and imposition of taxes, introduction and removal of exemptions, tariffs, etc. are all much-anticipated phenomena. Taxation has either a direct or indirect effect on almost every aspect of production and distribution. In recent years, there has been much discussion about the fact that the tax to GDP ratio is Sri Lanka has deteriorated over the years and that there is a need to increase tax revenues. Is increase in the tax rates the answer? This brings us to then to the question of what is the optimum rate of tax. Let us hypothetically consider a situation, where the tax rate in the country is 0%. If there are no taxes, then the Government does not get any income and the citizens do not spend any time worrying about how to evade taxes. In such a society people would be quite productive as they get to keep all their earnings. However, without the Government being able to spend on the police force and other law enforcement agencies, it would be difficult for the people to protect anything that they have earned. Therefore, taxation at 0% is not optimal. Let us now consider the other extreme. Taxes are imposed at 100% of income in which case everything you earn goes to the Government. This would undoubtedly increase Government revenue. If the citizens are not allowed to keep some part of what they earn, most people would rather spend their time doing some leisure activity. And there will also be a large movement to evade paying taxes. Society as a whole would not be very productive if everyone spent a large portion of their time trying to evade taxes. As a result the Government would still earn very little income from taxation. 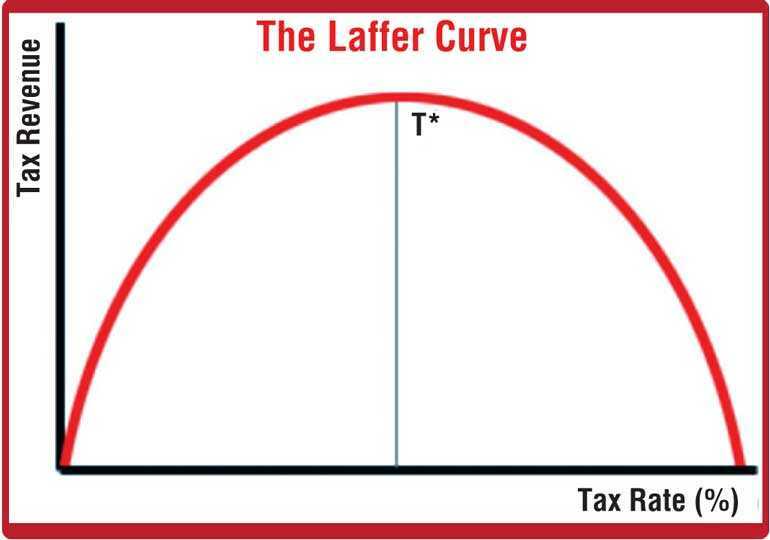 This has also been illustrated through the ‘Laffer Curve’ theory which implies that increasing tax rates beyond a certain point will be counter-productive for raising further tax revenue. This clearly goes to show the importance of striking the correct balance. Tax rates should not be too high, where the taxpayers spend more time trying to evade taxes, and also it should be at an adequate rate in order for Government to cover its expenses. The OECD in its research on Tax Policy Reforms 2018 has analysed the latest tax reforms across 35 OECD member countries. According to the results, many countries have eased their fiscal stance to stimulate the economy by lowering taxes, increasing government spending, or both. The focus has been on cutting taxes on businesses and individuals with a view to boosting investment, consumption and labour market participation. As such there is a trend to lower taxes in most countries in order to stimulate more production and investment. Is it direct tax or indirect tax? The proportion of tax revenue raised from direct and indirect taxes has important consequences for income distribution and economic growth. Direct and indirect taxes are defined according to the ability of the end taxpayer to shift the burden of taxes to someone else. Direct taxes allow the Government to collect taxes directly from the taxpayer, like in the case of income tax and is a progressive type of tax, which also allows for cooling down of inflationary pressures on the economy. Indirect taxes, like VAT and NBT allow the Government to expect stable and assured returns and brings into its fold almost every member of the society, irrespective of such person’s income level. The redistributive properties of direct taxes have historically been the reason for the introduction and expansion of such taxes. A reduction in income tax coupled with an increase in VAT tends to reduce the tax burden on higher income earners while increasing the tax burden on poor or middle income earners. Based on the performance report of the Department of Inland Revenue for 2017, the revenue collected from each type of tax in Sri Lanka is given in table 1 and chart 1. 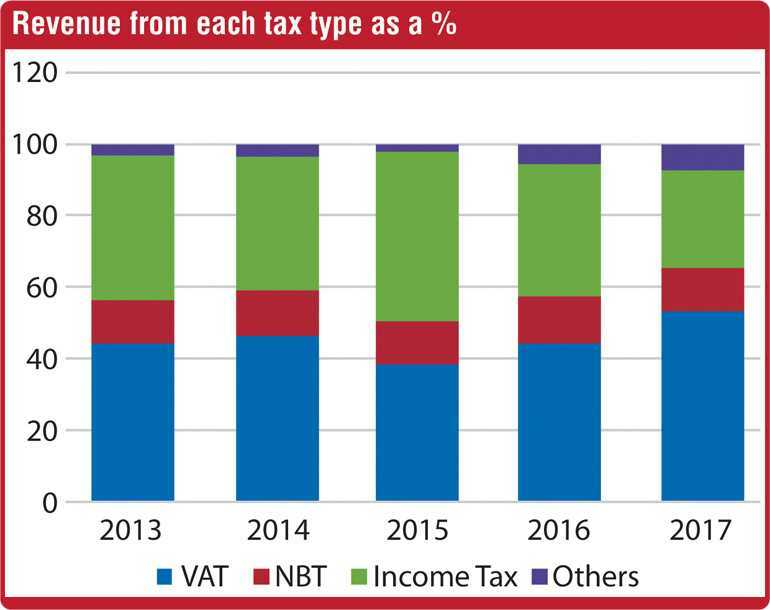 These statistics show a trend in decreasing revenue collected from Income Tax, whereas the income from indirect taxes like VAT and NBT has increased. 65% of the total revenue collected by the Department of Inland Revenue for 2017 was from VAT and NBT, while only 27% was from income tax. 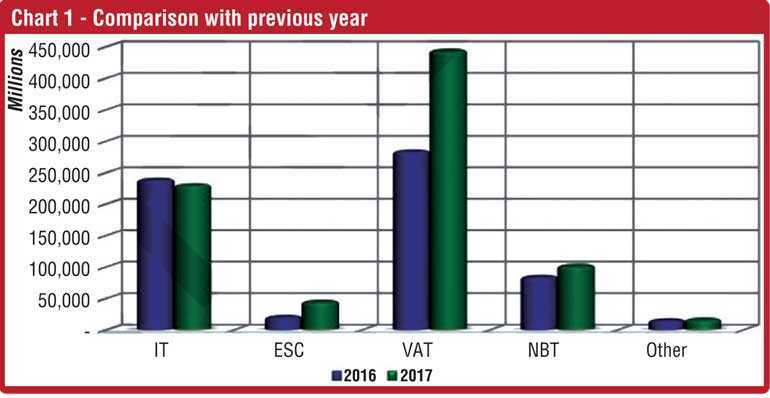 The significant increase in VAT revenue from 2016 to 2017 is due to the increase of the VAT rate in 2017. The numbers clearly indicate that a high tax burden is borne by the low to middle income earners rather than the high income earners. When the indirect taxes are increased, the consumers are required to pay a higher price for goods and services. Reduction in consumer spending then reduces business revenue, thereby counterbalancing the advantages of economic growth. In the recent past we have seen an increasing trend towards a higher percentage of tax revenue being from indirect taxes (see chart 2). It is clear that more than half of the tax revenue is from indirect taxes. If the Government seeks to increase its tax revenues by imposing higher indirect taxes, the burden will be felt mainly by the low and middle income earners and the disposal income in their hands will reduce and they will find it hard to make ends meet. So what is a good balance between direct and indirect tax? There is no simple answer. Overall it will be more beneficial to have a well-thought out strategy with long lasting impact, focusing on economic growth and sustainability. Is tax a matter of numbers alone? Speaking of taxation is generally limited to the numbers. However, taxation also has to take in to account the socio cultural dynamics in the society. Increasing Government revenue through tax cannot happen in isolation of these factors. For example, more citizens will be willing to pay their fair share of taxes, if they see benefits accruing to them and also to the society at large. Alternatively, taxpayers will shy their obligation of paying taxes if they feel that there is evident waste and excessive funding for un-productive ventures. In a recent study on Indirect taxes in South Asia, which covered the tax jurisdictions of India, Bangladesh, Pakistan and Sri Lanka, it was found that paying taxes in South Asia is often associated with corruption. Inadequate training of tax officials, low levels of professional qualifications, low salaries, lack of incentives, poor use of IT systems and numerous loopholes in the legislation are the leading factors contributing to corruption. If the people feel that the money they pay in taxes is used for only a certain section of the society, more people will try to evade paying taxes. Therefore, the mindset of the taxpayer and how they perceive the Government’s expenditure is also very important to achieve high tax revenues. The discussion about taxation should also not be limited to tax rates, Government revenue and expenditure, appropriation of the funds, etc., which are all to do with facts and figures. The thinking behind the policy changes and the explanation on what the Government is doing and for what purpose is also very important. People will understand the rationale for the changes and will be more willing to buy-in to the Government’s budget proposals if they can relate to the reasons behind it. For example, the Nation Building Tax (NBT) was introduced in 2009, post the war in order to contribute towards building the nation. However, almost a decade after that, we are still paying NBT. It is not to say that we are now not required to build our nation but rather, we find it difficult as taxpayers to relate to the reason for imposing such a tax. Further, maintaining consistency in tax policies is also critical in achieving higher tax revenues. Most businesses make projections and budgets for the future. These strategic plans are for medium and long term investments, with the timeline spanning for over five years. It is necessary for these plans to factor in the tax implications. Therefore, consistency in tax policies are important to attract more people to make investments, because they are then comfortable in making investments which are projected to make a return. However, where there are inconsistencies there is always doubt as to whether a change in the policies may eat into their returns in the short term which in effect makes them take a more ‘wait and watch’ approach. Therefore, taxation is definitely not all about the numbers. It is a more cognitive process where the taxpayers have to be convinced that tax is the price we pay to live in a civilised society. The focus of the policy makers should not be limited to the tax to GDP ratio and in finding ways and means of increasing this ‘number’. Policy makers should take a more holistic view of tax policy and tax administration. A lack of proper tax structures and issues in tax administration also contribute to the poor tax to GDP ratio. Tax is more than a mere source of revenue and growth. It also plays a key role in building institutions, markets and democracy through making the Government accountable to its taxpayers. Tax evasion debilitates efforts to fight poverty, weakens the fiscal base needed for sustainable economic development and creates an over-reliance on aid and debt financing. Therefore, importance should also be given to maintaining strong systems supported by technology to ensure minimum tax evasion. This can be done through strengthening the internal organisation structures within the taxing agencies and training, as well as through the introduction of new technology. Improvement requires independent revenue services within an integrated administration. The OECD Report on Tax reform Policy of 2018 identifies a number of common tax reforms trends across selected countries. One such trend is the personal income tax cuts on labour income, primarily to alleviate the tax burden on middle-income earners. Another mechanism has been to increase the earned income tax credits, which has the potential to improve labour market participation and enhance the progressivity of personal income tax. This is a relief provided to earned income which may take the form of salaries, wages, commission, etc. The relief in some countries are linked to the number of dependent children that the taxpayer has. This allows more working people and their families to keep more of their hard-earned money. Basically, many countries provide special incentives/concessions on employment income. However, in Sri Lanka we have seen a trend where the maximum income tax rate applicable on employees where no deductions are allowed on such income has been removed recently. Another trend has been to expand tax reliefs for some forms of financial income. Even in Sri Lanka we have a lower rate of tax on interest income earned by individuals, which will be considered as a final tax. This in turn encourages savings and provides relief for income which would have already suffered tax. A properly organised, transparent tax system, with minimal complexities and ambiguities is now accepted as the engine for development. We need to strive to achieve this through correct policy formulation and better tax administration. This will also reduce the compliance costs of the taxpayer which will attract more voluntary compliance. Leveraging on IT systems and data sharing is also important in order to optimise revenue collections for the Government. Data sharing among different Government departments, organisations, institutions, authorities and agencies as well as between different governments at regional and global level are important for broadening the tax base and to avoid tax evasion. Use of information technology and modern data tools will enhance the overall efficiency of the tax administration through better tax management, tax monitoring, taxpayer facilitation and dispute resolution. The national budget is very important to the people in a democracy like Sri Lanka as it is an expression of public policy. Governments are governed by the budget and not by the marketplace. Revenue and expenditure are controlled through the budgetary process. As such it is an important tool in managing the finances of the Government. The budget determines which activities are supported and which ones are to be deterred. The force of law backs government budgets and officials use it to guide the spending of the people’s money.